Romania—the last months of the Ceausescu regime. Adina is a young schoolteacher. Paul is a musician. Clara works in a wire factory. Pavel is Clara’s lover. But one of them works for the secret police and is reporting on the others. One day Adina returns home to discover that her fox-fur rug has had its tail cut off. On another occasion, it’s the hind leg. Then a foreleg. The mutilated fur is a taunting sign that she is being watched by the secret police—the fox was ever the hunter. Images of photographic precision combine into a kaleidoscope of terror as Adina and her friends struggle to keep mind and body intact in a world pervaded by complicity and permeated by fear, where it’s hard to tell victim from perpetrator. 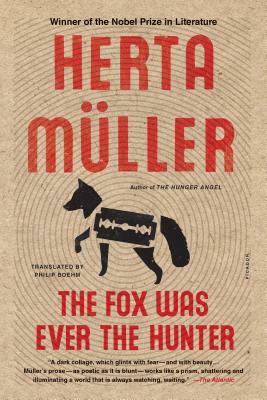 Once again, Herta Müller uses language that displays “the concentration of poetry and the frankness of prose”—as the Swedish academy noted upon awarding her the Nobel Prize—to create a hauntingly cinematic portrayal of the corruption of the soul under totalitarianism. Herta Müller is the winner of the 2009 Nobel Prize in Literature, as well as the International IMPAC Dublin Literary Award and the European Literature Prize. She is the author of, among other books, The Hunger Angel and The Land of Green Plums. Born in Romania in 1953, Müller lost her job as a teacher and suffered repeated threats after refusing to cooperate with Ceausescu's secret police. She succeeded in emigrating in 1987 and now lives in Berlin.